P/2011 N01 was discovered on 2011, Jul. 07.30 by Leonid Elenin and I. Molotov on four 240-s exp. 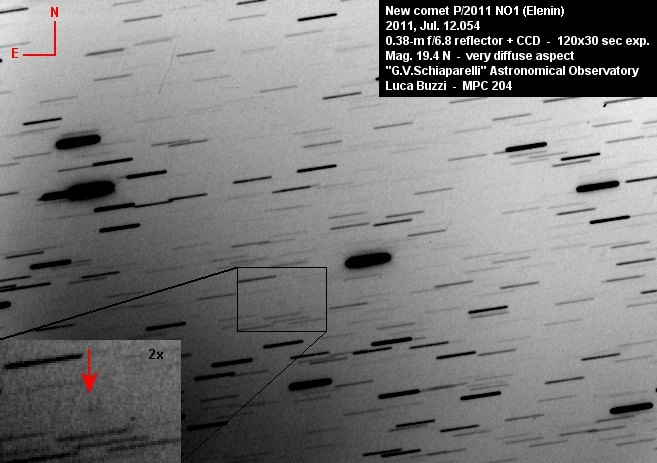 taken with a 0.45-m f/2.8 reflector + CCD from their remote ISON-NM Observatory, New Mexico, USA. the cometary appearance, including us. The first clear night in July here in northern Italy was between 11th and 12th. The sky was clear but quite hazy, especially at low altitudes, but the seeing was good. I waited until the moonset, and I took as much exposures as possible, totalling 60 minutes. The object was in constellation Capricornus at an average altitude of 24°. Due to the haziness of the sky, the images were not particularly good: the object appears diffuse with no clear central condensation or tail; in any case it is quite clear its cometary appearance. The discovery was announced on CBET 2768 (subscription required) and the astrometry, with a preliminary periodic orbital elements, published on MPEC 2011-N09 and N10.